"Best live music venue in town, most Boubon, best beers." 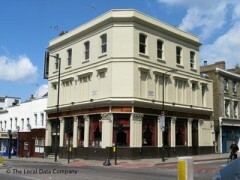 About: The Lexington is a pub, live music venue and nightclub in Islington. OPen late seven days a week we host the best live bands, DJs and the biggest selection of Bourbons and american beers in London! American bourbon bar below, indie club above. Between its relentless line-up of new and established bands and its collection of indie nights like White Light/White Heat there’s not a night that goes begging at The Lexington. Their top-notch live music programming has made the Lexington a favourite with music industry peeps, so unsurprisingly they’ve chosen indie record shop Rough Trade to host their pop quiz. It’s famously hard, and only the very knowledgeable succeed. On every Monday, prizes are drinks and vouchers for the record shop. With that Americana theme it’s got going for it, The Lexington has a bit of a swagger. Evidently the promoters agree and get their best bands to play upstairs in the Islington hot spot whenever they can. See anything from anti-folk to surf-pop with the likes of (our faves) Sonny and the Sunsets playing in the past. Having watched friends spend entire nights circling the place for singles – and finding them – All In London can attest to the Lexington’s suitability for those on the lookout for partnering up. The live venue/club on the top floor even gives you somewhere dark and loud to escape to if conversation begins to stall. The Lexington eschews single malts and blends in favour of Kentucky-Tennessee tipples like Knob Creek, Jim Beam and of course, Jack Daniels. For a music bar in Angel, the Lexington has an almighty bourbon selection, which has something to do with the explicit American retro theme running through it. Sip on enough sweet Wild Turkey’s and you might be tempted upstairs to the club for some funky chicken. The Lexington does a good line on all things American and that includes the jukebox. Think classic American rock and other good taste/guilty pleasure sounds to get you in the mood for a trip upstairs to its excellent live venue. When praise is lavished on The Lexington it is usually on the first floor live venue thanks to the consistent quality of its music. However, the ground floor American themed bourbon bar isn’t too shabby itself. Along with a Manhattan lounge theme, the bar serves up a long list of American beers and has one of the best bourbon menus in town. "Credible line ups and unpretentious vibe"
The Lexington has firmly established itself on London’s gigging map thanks to some very credible line ups and an unpretentious, friendly atmosphere. It’s conveniently located on Pentonville Road, tucked away from the brashness of Upper Street yet still close enough to all the action. The ground floor bar oozes American turn-of-the-century charm (think large chandeliers, thick red curtains and red velvet armchairs); one half expects a troupe of can can dancers to emerge and start wowing the audience with incessant high kicks. Instead, a suited compere is hosting a pop quiz courtesy of Rough Trade, and tables are filled with eager contestants chewing pens while pondering answers to questions like “What is the name of the 1983 album by The Fall to feature Mark E. Smith’s wife on vocals for the first time?” (Answer: Perverted Language). Music trivia aside, the upstairs is where the gigs take place. Hotly tipped bands and cult favourites are featured here as enthusiasts and music industry bods turn up to check out the new talent. The room has a capacity of 200 and a sound system capable of blowing delicate eardrums, but that’s part of the appeal. Hungry punters can head back downstairs and sample the American-infused, somewhat stodgy fare on offer: burgers, ribs, fish fingers and jerk chicken complement the long list of American beers and bourbons. A relaxed locale with slick line ups and heart-attack inducing food = a perfect evening.